NASA’s late Cassini spacecraft may have ended its mission in a death-dive into Saturn’s atmosphere, but the craft’s data is still keeping scientists scientists occupied. 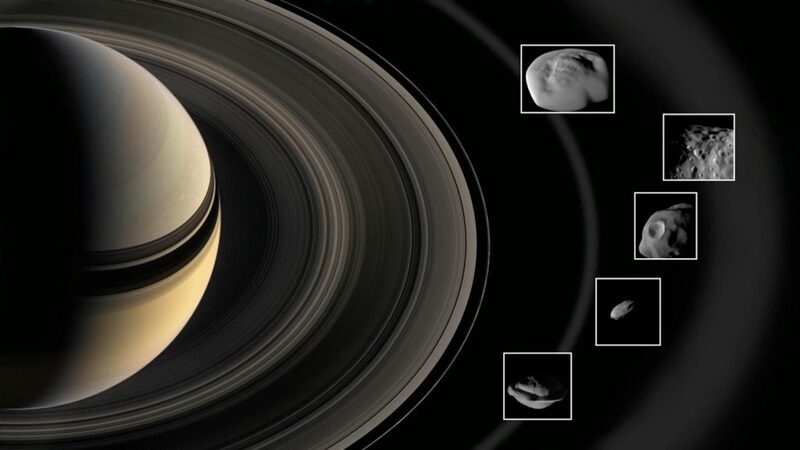 On Thursday, the craft’s operator NASA JPL revealed what Cassini discovered about the planet’s extraordinary ring system, and five moons within it. “The new research, from data gathered by six of Cassini’s instruments before its mission ended in 2017, is a clear confirmation that dust and ice from the rings accretes onto the moons embedded within and near the rings,” NASA’s JPL wrote in a release. These moons, named Atlas, Ephimetheus, Pandora, Daphnis, and Pan, span across Saturn’s outer A, F and E rings. But unlike the more traditional rounded moons we’ve come to know, like Earth’s Moon, these five are all “porous” and misshapen. “We found these moons are scooping up particles of ice and dust from the rings to form the little skirts around their equators,” said Bonnie Buratti, the head of 35 scientists studying the moons. NASA suggests that this may be an ongoing occurrence, that these moons are still scooping up ring material, slowly adding to their surfaces. Cassini’s data also revealed tidbits of the moon’s composition. The closer moons are also seemingly made of iron and other organics, while the outer ring moons consist of ice and other frozen debris. Scientists still aren’t sure how these moons formed; whether they were there prior to the formation of the ring but were destroyed, or whether they are merely denser pieces of Saturn’s rings that have grown larger over time. Additionally, this is also a question the scientists intend to pose for Neptune and Uranus, two giant outer Solar System neighbours with less substantial ring systems. “Do any of the moons of the ice giant planets Uranus and Neptune interact with their thinner rings to form features similar to those on Saturn’s ring moons?” asked Buratti. “These are questions to be answered by future missions,” she concluded.